SHIVA is among the most widely worshiped deities in India. With names such as Mahadeva ("the great god") and Nataraja ("the king of dancers"), he is venerated in ancient holy cities like Benares, where Shaivites (as his worshipers are called) devote their lives to him, viewing him as the Supreme Lord. The fact is, he is supreme. As the scriptures say, "Srimad-Bhagavatam is supreme among Puranas just as the Ganga is the greatest of all rivers, Lord Acyuta [Vishnu] the best among deities, and Lord Sambhu [Shiva] the greatest among devotees of Lord Vishnu [vaisnavanam yatha sambhu]." (Srimad-Bhagavatam 12.13.16) According to this and similar statements, Shiva may correctly be considered the greatest—at least among devotees—but among gods the supreme is Vishnu. This is made clear as far back as the Rg Veda (1.22.20): "The lotus feet of Vishnu are the supreme objective of all the demigods. Those lotus feet of the Lord are as enlightening as the sun in the sky." Shaivites, however, tend to see Shiva not just as the greatest devotee but as God Himself. There is some basis for this in scripture. In the Bhagavatam (4.7.50) Lord Vishnu Himself says, "Brahma, Lord Shiva, and I are the supreme cause of the material manifestation. I am the Supersoul, the self-sufficient witness. But impersonally there is no difference between Brahma, Lord Shiva, and Me." But a close study of scripture shows that while there is reason to see Shiva as nondifferent from Vishnu, there is also reason to distinguish strongly between them. According to Bhagavad-gita, which is accepted by nearly all classes of transcendentalists in India—including Vaisnavas and Shaivites—Vishnu (Krishna) is the ultimate Godhead, to whom even Shiva must bow down. This is not a matter of opinion or sectarian prejudice. Krishna identifies Himself as the source of all material and spiritual worlds ( Bg. 10.8), and Arjuna confirms that Krishna is indeed supreme (Bg. 10.12). Krishna is "the God of all the gods" (devesa, Bg. 11.37). In countless incidents from the Puranas, Shiva is clearly seen to be Vishnu's devotee. For example, there is the story of Vrkasura, a demon who practiced severe austerities and then asked Shiva for a boon—the power to kill at once any living being whose head Vrkasura would merely touch. Shiva granted the boon, but was soon to regret his decision, for Vrka came after him to try out the newfound power. Lord Shiva ran to all parts of the universe to escape this power-mad devotee and finally ended up at the door of the kingdom of Vishnu. Hearing the words of a frightened Shiva, Vishnu devised a plan to help him. Vishnu appeared directly before Vrkasura and told him Shiva was not to be trusted. "Shiva is fond of joking and even lying," said Vishnu. "I am sure he is not telling you the truth. He was just teasing you. Touch your own head, and you will see that nothing will happen." Vrka, of course, touched his own head and died. But the point of this story, in the present context, is Vishnu's superiority over Shiva, who could not resolve the problem on his own. After racing through the entire material cosmos to escape Vrkasura, Shiva sought refuge in Vishnu, the Supreme Personality of Godhead. To counter this, Shiva devotees cite traditions in which Rama, for example, is seen as a devotee of Shiva. This would make an avatara of Vishnu subservient to Shiva, and thus support the tenets of Shaivism. But upon closer study Rama's worship of Shiva turns out to be a later tradition, not supported in Valmiki's Ramayana. Moreover, even these later traditions explain that Rama became a devotee of Shiva only out of etiquette: Rama wanted to become a greater devotee of Shiva than the evil Ravana was, and then ask Shiva for permission to defeat Ravana. 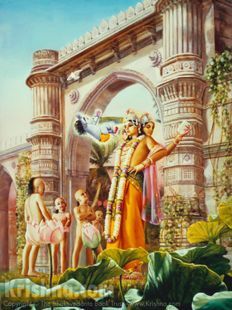 The Ramayana offers many stories about the glories of Shiva—his destruction of Daksa's sacrifice, his marriage with Uma (Parvati), his drinking of the ocean of poison, his killing of the demon Andhaka, his cursing of Kandarpa—but ultimately the Ramayana makes the supremacy of Rama quite clear. Rama (as an incarnation of Vishnu) is supreme. "Of the three principal agents controlling the three modes of material nature, Vishnu is the Almighty; even though He is within material nature for the purpose of maintenance, He is not controlled by the laws of material nature. 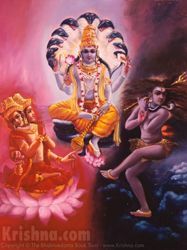 The other two, Brahma and Shiva, although almost as greatly powerful as Vishnu, are within the control of the material energy of the Supreme Lord." To clarify Lord Shiva's position, the Brahma-samhita (5.45) offers an analogy: "When milk is transformed by acids into yogurt, the yogurt is neither the same as nor different from the milk. I adore the primeval Lord Govinda [Krishna, Vishnu], of whom Lord Shiva is a transformation for performing the work of destruction." Though milk and yogurt are essentially nondifferent, yogurt is a product of milk. One can use milk to make ghee, cheese, ice cream, or yogurt, but one cannot turn yogurt into milk. Clearly, then, Shiva's divinity is intimately connected with, even dependent upon, his relationship to Vishnu. This is made clearer still in the Bhagavatam (3.28.22): "The blessed Lord Shiva becomes all the more blessed by bearing on his head the holy waters of the Ganges, which has its source in the water that washed the Lord's lotus feet." Srila Prabhupada comments, "Lord Shiva is important because he is holding on his head the holy Ganges water, which has its origin in the footwash of Lord Vishnu. "In the Hari-bhakti-vilasa, by Sanatana Gosvami, it is said that anyone who puts the Supreme Lord and the demigods, including Lord Shiva and Lord Brahma, on the same level at once becomes a pasandi, or atheist. We should never consider the Supreme Lord Vishnu and the demigods to be on an equal footing." So, theologically, Shiva is both God and yet different from God as well. Because of Shiva's intimate contact with the quality of ignorance and with matter (which is innately ignorant), the living beings in this world cannot receive the same spiritual restoration by worshiping him as by worshiping Vishnu. 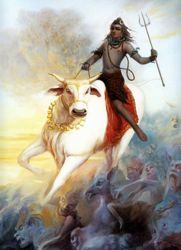 There are other forms of Shiva worship as well, but the only authorized form comes down in the Rudra Sampradaya, also known as the Vishnusvami Sampradaya, an authorized Vaisnava lineage in which Shiva is worshiped as the greatest devotee of Vishnu. Its adherents say that ultimate liberation comes from devotion to Vishnu. And Shiva, they say, showed how to be the perfect devotee. Even Shiva himself confirms that one can achieve the supreme destination only by the mercy of Vishnu. Lord Shiva says, mukti-pradata sarvesam Vishnur eva na samsayah: "There is no doubt that Vishnu is the deliverer of liberation for everyone." Shiva and Parvati, as his wife is also known, have their abode in Shiva-loka, between the material and spiritual worlds." (13) (see also Brahma-samhita 5.43).